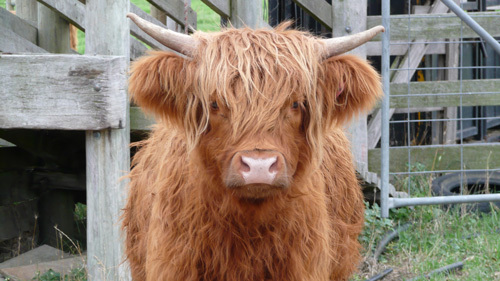 Below you will find links to a number of interesting articles on Highland Cattle. Aritcles included in this website are copyright of their respective authors who have kindly given their approval for their use. Otherwise an external link is provided to the original article. Angus Ruadh Mackay has been associated with the Highland Breed for fifty years. A past president of the Highland Cattle Society, UK, Mr Mackay has also been a member of the panel of judges for well over thirty years, judging at the National Western Stock Show in Denver on three occasions, and also in Denmark, Germany, Switzerland and Australia. During the 1990’s he ran the largest Highland beef business in Europe, Brig Highland Beef, marketing in excess of 200 Highland steers annually. Angus has been consulting since 1992 on herd assessment, stock management, advising on the establishment and development of new and existing folds, as well as writing regularly on all aspects of Highland Cattle breeding, management and the history of the Highland Breed. Once explained by educated guesses based on folklore and assumptions, we can now predict colour in our Highlands based on science with a fair degree of certainty. At the end of this article there are some charts to help you work out what colour calves you can expect with certain matings. The reason we can do all this is that DNA tests can now be performed to evaluate the actual colour of Highlands, as determined by what genes are at the three of the six loci that control colour in Highland cattle. 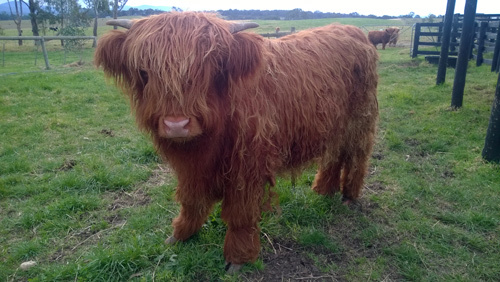 The kind of free-ranging management system which are used today by most Highland cattle breeders in the west of Scotland is very different to the historical systems of cattle rearing in this area. Traditionally cattle would be moved to summer pastures (transhumance) and closely herded during which time the best of the lower land would be cultivated. This pattern of landuse segregation was typical of small farms and crofts with common pastures and created a patchy mosaic of pastures, meadows and crops both in the hills and on the low ground. 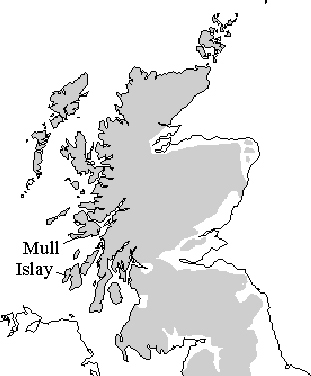 Cattle rearing in the Highlands and Islands during the past decades has changed markedly with commercial cattle herds using mostly continental breed bulls and larger suckler cows that need better nutrition and more supplementary feeding than the traditional breeds. Even the more traditionally managed cattle farms in remote areas changed their management practices, often using as pasture land that was formerly cultivated and forsaking the hill pastures. Roy Dennis MBE is a field ornithologist and wildlife consultant, living in Moray, Scotland; he has worked in the Highlands and Islands of Scotland since 1959, most notably on the conservation of rare birds and the reintroduction of lost species, such as the white-tailed eagle and red kite. From 1970 to 1990, he was the RSPB’s senior officer in Northern Scotland. He directed Fair Isle Bird Observatory from 1963 to 1970; was Chairman for 16 years until November 2010, on the completion of the prestigious new Bird Observatory, and is now the President of the Trust, so his knowledge of seabirds, migration and Scottish islands is extensive. He is a specialist in raptor conservation and reintroductions in the UK and abroad, having been involved with osprey, red kite, golden eagle and sea eagle reintroduction projects, and his satellite tracking studies since 1999 have broken new ground and given great interest to the public via our map-based website. He has long been an advocate for restoring lost mammals toScotland, particularly beaver and lynx. In 1992 he was awarded a MBE for services to nature conservation in Scotland and in 2004 was voted the RSPB Golden Eagle Award winner for the person who had done most for nature conservation in Scotland in the last 100 years. He is a writer, lecturer and broadcaster. 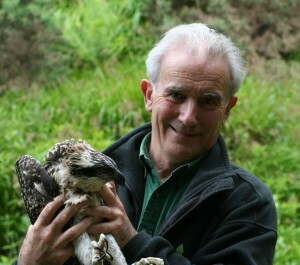 His latest book (2008) is ‘A Life of Ospreys’ and his TV documentaries include Eagle Owl and Saving our Seabirds. He was a presenter on BBC Autumnwatch in 2011 and Springwatch 2012. 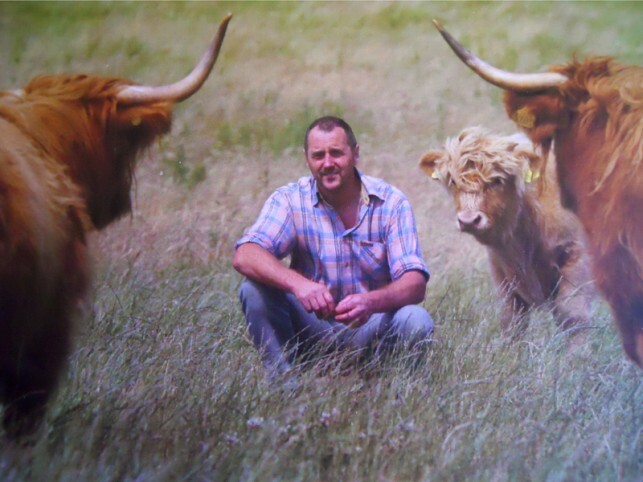 Roy Dennis is the author of an article which we feel will be of interest to Highland Cattle breeders and conservationists throughout the world. The article is titled ... "The importance of traditional cattle for woodland biodiversity in the Scottish Highlands" and is to be found on the website of the Highland Foundation for Wildlife. Highland Foundation for Wildlife Please visit the website for other great articles, and read about this organisation. 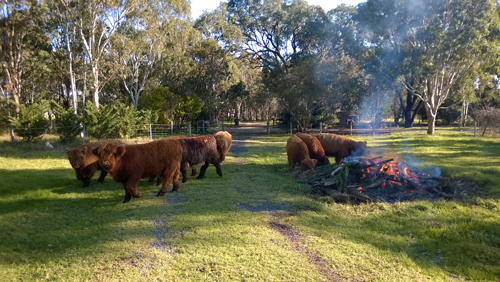 Are you interested in purchasing Scottish Highland Cattle in Australia? 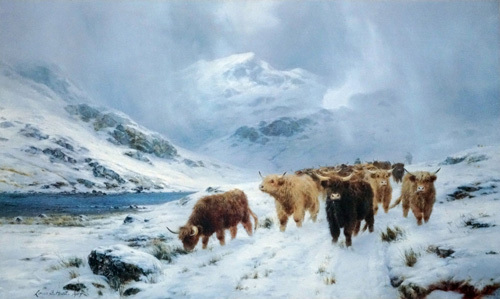 The header image is taken from a limited edition print, owned by the sites sponsor, of a painting by Louis B. Hurt 1907.